Sen. Chuck Schumer (D., N. Y.) told a Brooklyn crowd Monday he wanted to impeach President Donald Trump, and "the sooner, the better." MAN (off camera): "When y'all gonna impeach Trump?" SEN. CHUCK SCHUMER: "Sooner the better." MAN: "‘Sooner the better?' That's not answering the question." SCHUMER: "Gotta get a few Republicans [inaudible]. WOMAN (off camera): "We’re trying. We’re voting." SCHUMER: "We’re Democrats. We’re on your side." 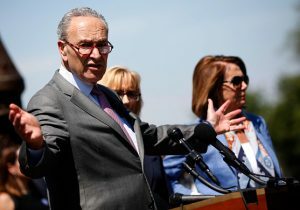 Schumer had been notably quiet on the question of impeachment prior to his unscripted remarks; when asked just last month about prospective reprisal were Trump to pardon former Trump associates Michael Cohen or Paul Manafort, Schumer demurred. "I’ve said what I’m gonna say," he said. House Minority Leader Nancy Pelosi (D., Calif.) had previously resisted calls from the party base to seek impeachment, claiming it was "not a priority." Before calling Monday for impeachment, Schumer had previously used the president’s legal trouble to seek a delay of Supreme Court nominee Brett Kavanaugh’s confirmation hearing, which is underway on Capitol Hill. Schumer made the comment at the West Indian Carnival, a Labor Day parade held in the Crown Heights area of Brooklyn, New York, that regularly draws thousands of participants and millions of attendees.